to keep your cat healthy." Flea control is essential. Period. Uncontrollable itching and scratching. Allergies. Tapeworm. Hair loss. Major discomfort. Even anemia and more serious health problems. Fleas hurt your cat. Controlling fleas on your precious cat and in your cat's environment is so important in helping you deal with one of the worst external parasites your cat will ever face. Keeping your cat and your home flea-free is not only important for your cat's health, but for your own health, as well. At the worst, even one single bite can lead to serious problems for your kitty. Uncontrolled fleas, infestation, and bites can lead to allergies, tapeworm, anemia, etc. Diligence is an important part of taking care of your cat. Prevention is your absolute best method of controlling this parasite. The two best ways to prevent infestation are excellent nutrition and keeping your cat's environment clean. No matter how much you directly treat your cat for fleas, if you don't treat her environment and keep it clean, you won't be able to eliminate all the fleas in your home and on your cat. Understanding the life cycle of the flea can help explain how cleanliness can reduce and eliminate this problem on your cat and in your home. If your best flea prevention efforts don't work and you find yourself with a problem anyway, treatment and control are your next steps. You have a number of options available to you. Most options can be classified as either conventional methods to eliminate fleas or natural methods. Indoor Cats Need Protection, Too! Flea control is critical for all cats, even those cats who never go outside. As a matter of fact, your indoor cat and cat environment can have an even worse flea problem than your outdoor cat. We often make the mistake of thinking that just because our kitty lives indoors, he will never have any fleas. Wrong! Fleas can be brought into your home from various sources, such as other animals and even you. Fleas are excellent hitchhikers! They can hop on your clothes when you're outside and jump off once inside your home. 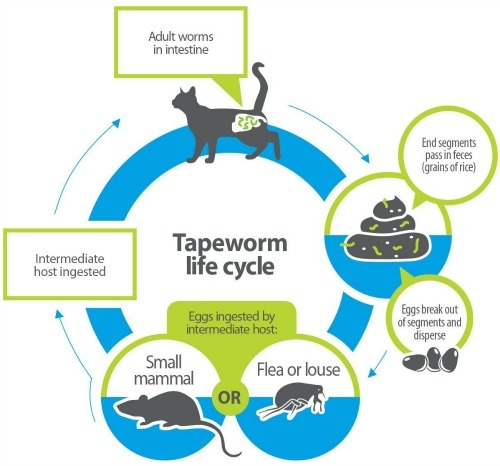 One of these nasty parasites can lay up to 20 eggs at a time and at their worse, they can lay eggs every day! So by the time you realize you have fleas, your home may already be severely infested. Fleas are parasites. They prey on weakened and less healthy cats. Veterinarians commonly observe that cats in the poorest health attract the most fleas. So the healthier your cat is, the less likely you'll have infestations on your cat and in your home. And if you end up with a flea problem, your healthy cat will be in a stronger position to deal with your flea elimination efforts. To keep your cat healthy, feed him a diet of the highest quality cat food you can afford, make sure he gets regular exercise with safe and interactive cat toys, and keep his environment clean. Add regular grooming to these preventative measures and you should be able to keep your cat in excellent health and flea-free. The most obvious sign of a flea is the flea body itself. These are reddish-brown little guys about the size of a pinhead. They have incredible jumping ability. They are often easily found around your cat's neck and base of the tail. But just because you don't see the body, don't assume there aren't any around. Fleas go through various life cycle stages, and they can be present in your home in different (almost invisible) stages. To check your cat or kitten for fleas, part his hair around his neck, back, hind legs, and near the base of his tail. You can also use a special flea comb and run it gently through these areas to check for fleas. In addition to actual fleas, you are also looking for any tiny black flecks. These black flecks are flea excrement (or "flea dirt") and are a sure sign that these pesky parasites are around. To be extra sure that these black flecks are flea dirt, you can place the flecks on a wet paper towel. If you see a reddish brown circle form around the fleck, you've got yourself some flea droppings and a flea problem (the flecks are your cat's digested blood). And although not every itch means that your kitty has fleas, you should suspect the parasite if your cat is doing a good deal of licking and chewing around her hind legs and back, especially near the base of the tail. This is often accompanied by hair loss. If your feline friend is licking and chewing a lot, be sure to give her a thorough inspection. Inspecting your outdoor cats for fleas should be a regular part of your flea control efforts. If you find yourself with a flea problem, you'll probably need to try a couple of different flea control methods before you get rid of all of the fleas on your cat and in your home. It's up to you to choose which treatment you think is best for your cat, you, and your home. Treatments may include using flea collars, flea combs, flea dips, flea powders, flea exterminators, and other flea control methods. In addition to treating your cat and your home, you may also have to treat your yard. Diatomaceous earth is the best remedy for outdoor issues. Taking care of a flea problem doesn't mean only getting rid of the adult fleas or just the fleas you can see. You also have to get rid of all the fleas in their various life stages throughout your home and your yard. This will require diligence on your part to get rid of all the fleas, but it is well worth it for your cat's health. Choosing a safe, as well as effective, method of flea control is critical. Different levels of danger accompany all flea control products and methods and you should choose only the safest and most effective method for your cat and you. Be careful when applying chemical flea treatments to your cat, as these will irritate any open sores she may have. Also, chemical flea medicines should not be used on kittens under the age of four months. These are two good reasons for trying to stick with natural flea control products, as they are generally less irritating to your cat and her skin, and overall, less dangerous for your cat, the environment, and you. Extra care should be taken for your older cat. If you use chemicals to control fleas, remember that your older cat is more susceptible to poisons than she was as a younger cat and her body is less able to tolerate large amounts of toxins. Check the label to make sure that the flea control product is safe for older cats and follow the directions carefully. If you are unsure, consult your trusted veterinarian for advice. Amazon is probably one of the cheapest places you can find popular conventional flea control brands at low prices. They carry Advantage, Frontline, and Program brands. Only Natural Pet Store has the absolute best selection of natural flea control products and, in my opinion, the best customer service on the internet. Didn't find what you're looking for? Use this Search Box to find more information. Or visit the related topics below.